Good morning! Would you believe that the time has rolled around once again to start sharing sneak peeks of the new releases at Peachy Keen Stamps? Well, it indeed has, and this Saturday, May 5th will be the day when you can purchase these lovelies in the Peachy Keen Stamps Store. Here's my sneak peek using stamps from the new May Stamp Of The Month set, as well as The Peachy Picks Kit. Oh my is it EVER a fantabulous combo!! SO perfect for so many summer themes. You're gonna LOVE them!!! There's lots going on to celebrate the release of these new kits. 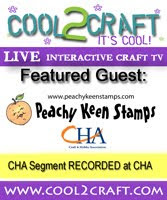 First, are the sneak peeks which you can find on the Peachy Keen Stamps Blog starting with yesterday's post. Those will continue right up to release day. THEN on Saturday at 6:00 p.m. (CST), we'll be celebrating with a party on The Peachy Keen Connection. We've got games, challenges, and chatting planned, and as always there's opportunities to win lots of terrific prizes. DON'T MISS IT! It's gonna be LOTS OF FUN!!!!! Also plan to hop along with us for the first ever Peachy Keen Alumni Blog Hop! Our alumni designers have been busy creating for our That's What Friends Are For Blog Hop, and you're going to love what they've been up to. Of course there's going to be more prizes for the taking, so PLEASE JOIN US!!!! Thanks so much dropping by today. Have a blessed and beautiful day and Happy Stamping!!! This is adorable !! I love all the elements you put into this the paper ruffle on the top, the pins everything !!! This card is just way to adorable for words. Love it. These are just too cute! I love those lanterns and the twine is fabulous! Absolutely amazing! Those colors are so gorgeous!! I LOVE the shine!! in the lamps!! So beautiful!! What a super silly, cute card! I love it.